2nd order active lowpass components calculator. First one have to enter the cut-off frequency and gain. After this one may choose the filter type and preferred values. The button Start is used to start the calculation. The results will be shown in the result table below. 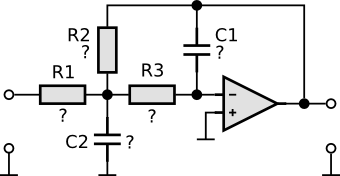 You may use a combination of two resistors if one resistor is not good enough.